Card sorting is a practice used frequently by information architects and designers to gather and structure inputs for a variety of purposes. In a common use of card sorting, information for a website is put onto the cards, and the sorting helps create categories for navigation and the overall architecture. The method works just as well for creating slides for presentations, or at any point where information needs to be sorted and organized in a sensible way. 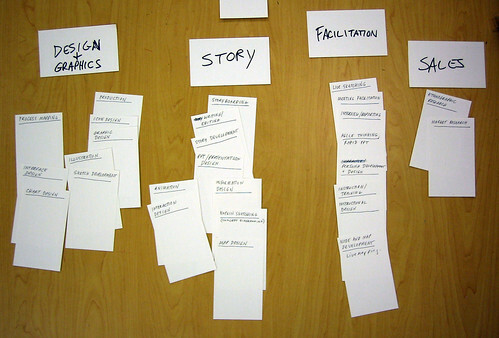 The applications of card sorting are numerous, and in use it works similarly to Post-Up and affinity mapping. Card sorting can differ from these methods, however. First, the cards are generally prepared in advance, although participants should be allowed to create their own while sorting. Second, the cards are a semi-permanent artifact and can be used as a control over several exercises with different participants to find patterns among them. Use 3×5 index cards or similar. For a typical sorting exercise, aim for 30–100 cards in total; more than this range will likely overwhelm the participants, and fewer may not be meaningful enough to be worth the effort. On each card should be a succinct bit of information; enough to tell the participants what it is and no more. Putting too much information on a card will slow down the sorting; not enough will cause confusion and will slow down the process even more. Give the group the shuffled deck and a stack of blank cards. Describe the overall organization challenge, and ask them to sort the cards into groups that go together. If they think something is unclear or missing, they may alter a card or create a new one. Once they have created the groups, ask them to name them and describe them. There are variations of sorting—including asking the group to rank the items from most to least desirable or to organize the cards into two categories such as “must have” and “nice to have.” You may also ask the group to sort cards into a predefined set of categories, to test their validity. Although the Card Sort game won’t tell you everything you need to know about a set of information, it will help reveal the thought process of participants. In this sense, it’s more about people than information. Only after a number of sorting exercises with a number of groups will larger patterns appear. 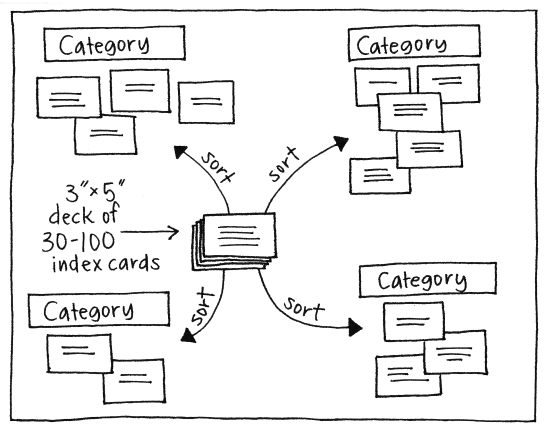 Card sorting is a common practice of information architects and designers of complex systems. Its actual source is unknown.